For the prophetic tripod is above. Shemaiah (Samea in the Septuagint) was a prophet in the reign of Rehoboam (1 Kings 12:22-24; 2 Chronicles 11:2-4). According to 1 Kings and 2 Chronicles, the intervention of Shemaiah prevented a war between Rehoboam and Jeroboam after the latter had led the northern tribes of Israel to separate from the tribes of Judah and Benjamin. King Rehoboam had assembled 180,000 troops to forcefully bring back the ten rebellious tribes. 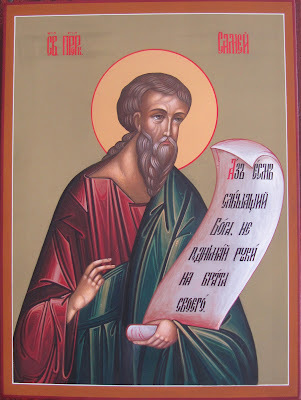 Shemaiah was known as a "man of God", and he prophesied in God's words, "You shall not go up nor fight against your brethren the children of Israel. Let every man return to his house, for this thing is from Me." Shemaiah's words were obeyed and the army stood down. This was a timely reminder of the unity of the Hebrew race, notwithstanding the division of the kingdom. We also read that the Prophet Shemaiah wrote his own book, but it has been lost to us. As it says in 2 Chronicles 12:15, "As for the events of Rehoboam’s reign, from beginning to end, are they not written in the records of Shemaiah the prophet and of Iddo the seer that deal with genealogies?" Furthermore, this Prophet should not be confused with Shemaiah the Nehelamite in Jeremiah 29:24, who was a false prophet. This confusion is often made when the Prophet Shemaiah is referred to as "the Elamite". In fact, there are eighteen others in the Old Testament that carry this name.